A mention of the Burmese is in a book of poems published during the Ayudhya period (1350-1767). In Siam, the golden-eyed black cats were participants in religious rituals, but in Burma they were brownish in colour. The modern breed traces its origins to a breeding effort in the United States during the 1930's. Wong Mau, a brown Burmese female from Burma, was imported by an American doctor, the cat mated with Siamese and produced kittens with many different colour patterns, including a dark solid brown. 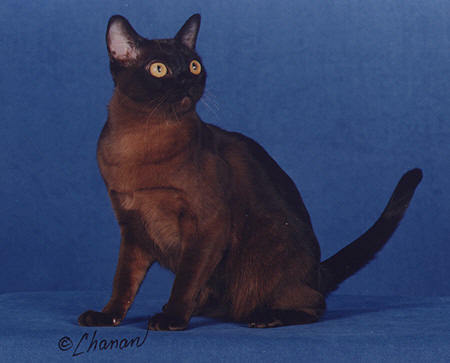 The brown cats became the core breeding stock of the new breed; each Burmese cat traces its heritage to these felines. British breeders imported their first Burmese from the United States in 1947, and the breed gained recognition in the United Kingdom in 1952. Burmese carry surprising weight for their size and have often been described as "bricks wrapped in silk." Burmese have large, expressive eyes that are great pools of innocence and seductive appeal, irresistible in effect. These eyes are their most persuasive weapon in an arsenal of endearing traits that mask an awesome power to hypnotize their owners into life-time love affairs through which they effortlessly rule their families. As kittens, Burmese are quite lively. They often seem clumsy when they attempt feats beyond their capabilities and land on their rears with solid little thumps. They will be playful well into adulthood. As Burmese grow, their high intelligence emerges and their own individual personalities start to unfold. They mature into charming, resolute executives who move in and take over a household, running it efficiently with those big eyes and a velvet paw. If encouraged, many Burmese converse with their humans, using soft, sweet voices (they are neither loud nor raucous). Some of their favourite chores are assisting with paper work or reading (by sitting on top of the material), or going into cupboards (to demonstrate where things ought to be). Typically, Burmese are always with people. The females tend to request center stage and take an active role in ruling the household. The males prefer to supervise from the lap position, are more laid back and less opinionated. If emotionally slighted by their owner's obtuseness, Burmese may sulk, but, fortunately, not for long. The Burmese coat still exists in a dark sable-brown colour. the rare Tiffany breed is essentially a longhaired Burmese. The "Burmese" has lost many of the skills it needs to survive in the wild. Being far too friendly for its own good, it should always be kept safe indoors.